Since offering treatments as of several months ago, we still await confirmation of more significant positive effects from PRP before we begin publishing patients’ cases. Although we have seen positive effects in the operating room and in our photo lab, we now recognize how the majority of our patients can benefit from PRP (Platelet Rich Plasma). Quicker healing, less swelling, and less skin discoloration are primarily the effects that we have been observing since treating our 100th PRP patient. Many of these patients are veterans and return patients so the changes are very noticeable to those who have previously experienced our CIT method. Currently, I have been in conversation with multiple patients and they have said that PRP has made their last session the best CIT “non-strip” hair transplant session to date. At the moment, I would like to present actual testimony that these words stand true. We look forward to furthering our efforts and discovering better ways to apply this intervention. » noticeable to those who have previously experienced our CIT method. » efforts and discovering better ways to apply this intervention. Wow - more anecdotal evidence. Great. Planning on releasing any objective data anytime soon? Hair counts, etc.? Double blind studies and so forth? They abandoned the claim that PRP increases hair count. It’s now being used as a post-surgical anti-inflammatory. $600 for quicker healing? Eh, I probably wouldn’t ever get it, but I can see someone with deep pockets and a tight schedule doing it. 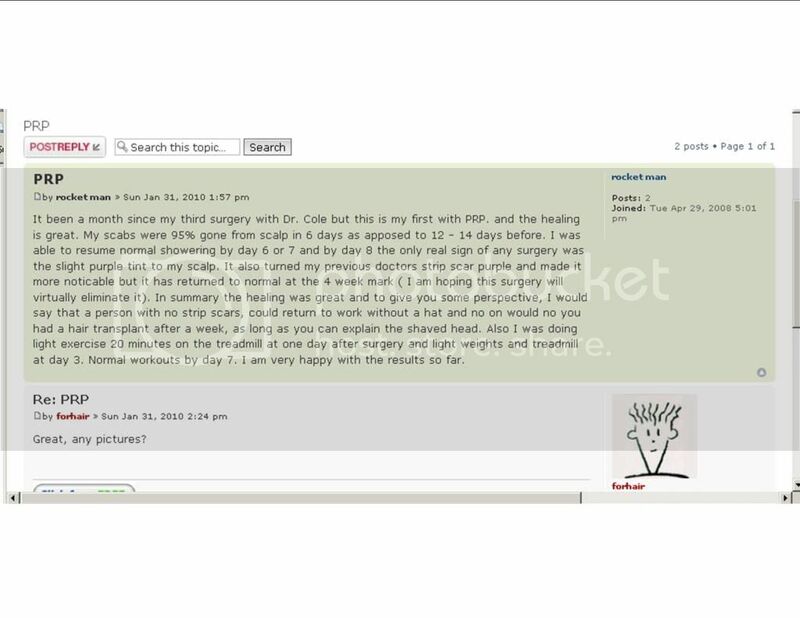 hi its been a while since i posted but i check the HM forum once in a while.Is there any reason why the Cole Clinic is posting in here?Does this have anything to do with multiplying follicles or expanding the donor resources? Truthtales, after your post on how to get in contact with dr. woods, you vanished. I thought hairsite put a hit on u or something. Check out the the quality and trust of their “Testimonial” friend’s post. He has an ENTIRE 2 posts LOL. I recently had an fue procedure with Dr. Bisanga and I had hardly any signs of surgery after only 4 days and this was without the use of prp, so I don’t quite understand why healing after 7 days with prp should be so incredible, can you please explain. Please keep in mind that I also had 200 fue extracted from my face and the healing was just as fast. Here is a link to my pictures which show the post op healing. I am a repair patient. » fue extracted from my face and the healing was just as fast.